Sigma Technology Solutions in Växjö works with information development, management and software design. The company is constantly growing and has already signed contract for a new office. In the autumn of 2018 Sigma Technology Solutions will move to Växjö’s flagship office building – Icon. 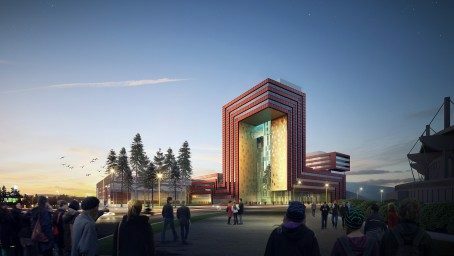 Icon will become the tallest building in Växjö. The 20-story building will have a room for offices, hotel, apartments and school. “Demand for our services is constantly increasing, and we see great opportunities with the region development. We expect a strong growth in Växjö in the near future,” says Niklas Malmros, CEO at Sigma Technology Solutions. “Sigma Technology moves to the fresh new premises in autumn 2018, and we are very pleased to be able get such a tenant of Sigma’s caliber. Right now we are working hard renting the Icon’s office space, but there are still some good opportunities available for the companies interested to move in,” says Henrik Swahn, CEO at APP Properties. Read about Sigma Technology and Icon in Vxonews (article is in Swedish). Sigma Technology is part of Sigma, and is a global supplier of product information, embedded solutions, and offshore development. We are experts with a passion for technology and information, and take pride in delivering quality and constantly improving our deliveries. Our philosophy is ‘Local Drive – Global Strength’, therefore we have offices worldwide to be close to our customers. Sigma is owned by Danir AB and has about 3,000 employees in 12 countries. For a complete picture, visit sigmatechnology.se.